The dependability of STIHL equipment is legendary. As your STIHL Dealer, we stand behind that equipment and service what we sell. STIHL MasterWrench Service® is a designation recognizing select STIHL Dealers who have continually exceeded expectations through extensive training and a proven track record of customer satisfaction. 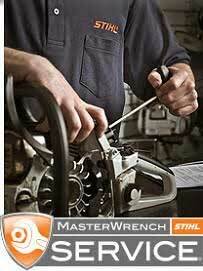 We are proud to be STIHL MasterWrench Service® Certified. Why are we STIHL MasterWrench Service® Certified? There are four levels of STIHL-certified service training – Bronze, Silver, Gold and the extensive Platinum training level. STIHL MasterWrench Service® certification is granted exclusively to technicians who complete the first three stages of training; Bronze, Silver and Gold. STIHL MasterWrench Service® Platinum level certification is now available to recognize STIHL certified service technicians and Dealers having high levels of service competence above and beyond that of other STIHL MasterWrench Service® Dealers. STIHL-certified workshops are conducive to performing maintenance and repairs at the high level of quality that our STIHL MasterWrench Service® technicians have been trained for, and workshops use specialized STIHL tools in all of their repair work. Because of their mastery of the craft, our STIHL MasterWrench Service® technicians can provide customers with efficient repairs and maintenance as well as offer expert advice on the proper care and upkeep of their equipment. Trust your equipment to a STIHL MasterWrench Service® technician. Come see us for all of your STIHL servicing needs!